I had no idea until recently that there was such an interest in costumes for the cult series Firefly. 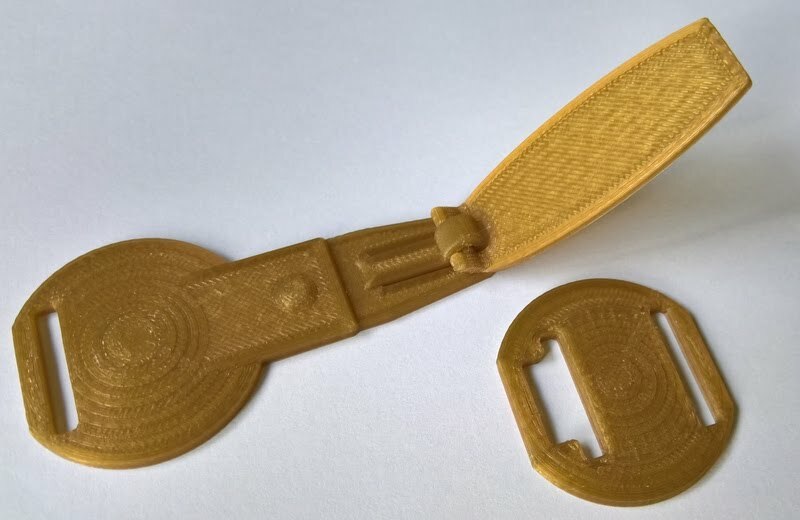 As you can see from the picture above, I incorporated small rafts in the design to avoid the need to use the automatic ones which can give a slightly rough appearance to small flat items.These rafts are very thin and easy to break off after printing. They're only needed underneath the supports for the hinge so they don't affect the final product. The clasps are designed to spring down into place. You have to be a little careful when assembling them, but once done, they seem fairly usable. These are as-printed after minor fettling and assembly. They could be sanded and polished, painted, or finished by various other means such as XTC-3D, or even coated with conductive paint and electroplated.